Click for ZYP main website page: SEG-AEROSOL-BRUSHABLE . 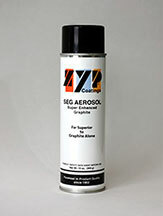 ZYP Coatings, Inc., the world’s leader in high temperature coatings, offers a superior enhanced graphite dry film aerosol spray that improves graphite’s performance as a high-temperature, anti-stick release agent/lubricant - FAR SUPERIOR to graphite alone. 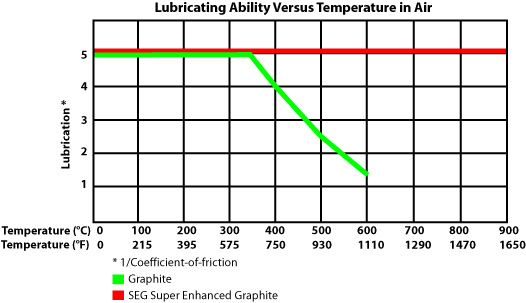 Super Enhanced Graphite, SEG, offers excellent lubrication and release while also exhibiting excellent thermal conductivity. SEG provides great adherence to most all surfaces and is fast drying. Unlike graphite alone, SEG will not lose performance in vacuum environments. SEG contains no silicones nor moly disulfides. These recommendations are believed to be accurate. No guarantee of their accuracy is made and the products are sold without warranty, expressed or implied. Purchasers shall make their own tests to determine suitability of their use. and excellent from room temperature to over 900 C or 1650 F. And, due to the lubricating ability of special additives, not being dependent on having water in its crystal structure, SEG also exhibits excellent lubrication even in vacuum environments. © 2018 All Rights Reserved ZYP Coatings, Inc.